We're having an exciting monsoon season at PhotoForward! Thanks to your support, we've taken our photographers on an amazing trip to the birthplace of the Angkor empire, had over 500 visitors at our new Celebrating Women exhibit in Siem Reap, Cambodia, and wrapped up our successful two-year Culture Keepers museum exhibition in Luang Prabang, Laos. Check out our updates below, then help support our programs, so we can keep connecting communities through projects that inspire positive social change, creative collaboration, and cultural understanding. Participants in the 2016 Photo Challenge and their friends and family celebrated our success with a trip to the temples, jungle, and waterfalls of Kulen Mountain. For many members of our team, this was their first visit to this important religious and cultural site. This trip offered a fun and important opportunity for intensive skills improvement, one-on-one feedback, and the unique experience to collaborate as a community of artists. Special thanks to our friend, Claudia Komminoth, for supporting the trip, Konthea Mean from Journeys Within Our Community (JWOC) for helping to organize resources and planning, and the whole PhotoForward team for making this an amazing day! Celebrating our Two Year Exhibition in Laos! After two successful years, PhotoForward's partnership exhibition Caregivers to Culture Keepers: Stories from Women in a Changing Laos at the Traditional Arts and Ethnology Centre (TAEC)* in Luang Prabang, is coming to a close. Since it opened in 2014, almost 40,000 international and Lao visitors have experienced this unique exhibition featuring photography, documentary videos, oral histories, and cultural artifacts created and curated by Lao women and girls from our Stitching Our Stories: Community Research Program. If you were unable to visit TAEC's museum in Laos, not to worry the Culture Keepers exhibition is now available online! Meet the 2016 Photo Challenge International Jury! This remarkable group represents eight countries, four continents, and an impressive range of professional and creative expertise. We are so grateful to our amazing team of artists and advocates who have shared their creative insights and feedback with our Photo Challenge candidates! If you missed the Celebrating Women's Strength & Stories exhibition at Sister Srey, you can see the artists and their work in our online Gallery! In 2015, Robert Rose and the crew of Raw Travel TV visited the Caregivers to Culture Keepers: Stories from Women in a Changing Laos exhibition developed in partnership with Traditional Arts and Ethnology Center (TAEC) museum in Luang Prabang, Laos. The Southeast Asia Road Trip episode originally aired on U.S. television in October and December 2015 and March 2016, but don't worry if you missed it ... now you can view the video online! Visit the Raw Travel TV YouTube page to see our project in Laos and to learn more about this innovative, independently produced TV show that celebrates travel with a conscience. Check out our partnership exhibition online: Caregivers to Culture Keepers: Stories from Women from a Changing Laos and learn more about TAEC's work at: www.taeclaos.org. PhotoForward has a big year ahead! PhotoForward is working to launch new partnerships with community organizations in East Indonesia and Borneo with a focus on expanding intergenerational projects for women and girls. But we need your help to get our new projects off the ground! Be sure to connect with us on Facebook, Twitter, and Tumblr for updates on our creative adventures, news about our progress, and insights on the power and value of media literacy in the modern world. We need your support to complete our current projects in Cambodia and develop new programs in Indonesia and Borneo. We hope that you will give what you can and also help us to reach out to new friends who may be inspired to support our work. Please select the giving level that works best for you and click the corresponding link - thank you! Pays for a photo trip and workshop for 20 PhotoForward photographers in Cambodia who will improve their skills, collaborate with their peers, and connect with their country and cultural history. $1,000+ The Muse: Understands that creativity can change the world! 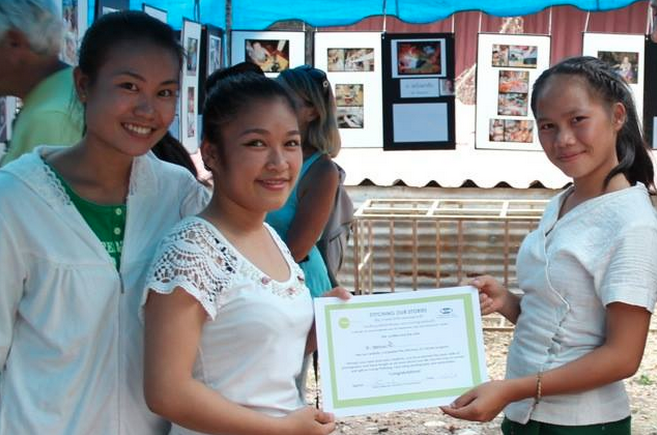 Celebrating Two Years of Culture Keepers in Laos! Since it opened in 2014, more than 30,000 international and Lao visitors have experienced this unique exhibition featuring photography, documentary videos, oral histories, and cultural artifacts created and curated by Lao women and girls from our Stitching Our Stories: Community Research Program. If you were unable to visit TAEC's museum in Laos, not to worry the Culture Keepers exhibition is now available online! work that Lao women do every day." Through their work, the Stitching Our Stories media makers have shed new light on the diverse and significant roles women play in Laos and their ongoing commitment to sustain cultural heritage while embracing new opportunities in a rapidly changing country. 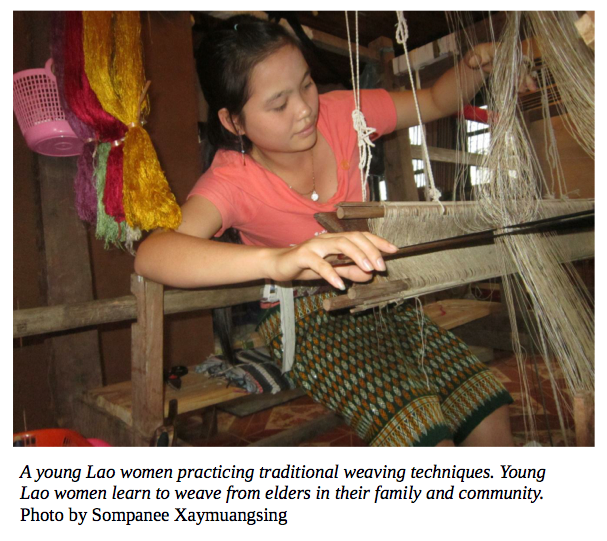 Visit the Culture Keepers Virtual Museum to learn more about our media research team and the lives of women in Northern Laos as seen through the themes of Work, Family Life, Heritage through Handicrafts, and Healers & Seers. 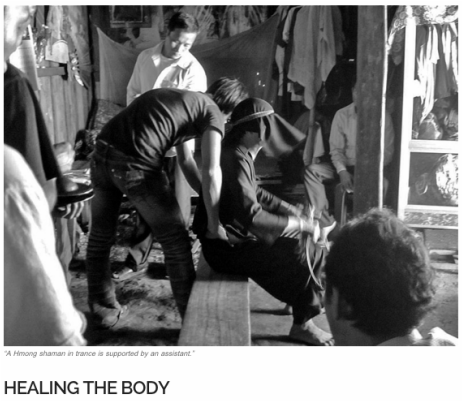 "...The section highlighting the impact of women on Laotian culture is especially provocative. This is certainly a 'must-see' attraction on Luang Prabang"
Join us this month on Facebook and Twitter as we feature highlights from the Culture Keepers collaboration and celebrate the Stitching Our Stories artists who made this unique project possible! WOW! STITCHING OUR STORIES TOPS 40,000 VIEWS! Almost 30 candidates for our 2016 PhotoForward Photo Challenge were tasked with using the skills they developed through our digital media workshops and peer mentorship to tell a compelling visual story about the lives of Cambodian women. From over 200 photographs submitted for the Challenge, our International Jury identified 20 images and photo sets as the most successful for their creativity, skill, and beauty and for the strength of their visual storytelling. Each artwork is accompanied by a portrait of the photographer as well as her/his artist statement. The photographers' images provide insight into their subjects' experiences as well as valuable social context about the lives of women and girls in modern Cambodia. WOW! More than 40,000 Views! Join the tens of thousands of people from around the globe who are "seeing the world through our lens"! The Stitching Our Stories Community Research films were made by and about Lao women, and their unique perspectives reveal the lives and stories of women from diverse ethnic communities as they navigate their country's rapidly-changing cultural landscape. The filmmakers selected their own research topics and documented a range of subjects, including childbirth rituals, traditional medicine, shamanism, and endangered textile and handicraft traditions. Visit the SOS YouTube Page to learn more. The Stitching Our Stories project was developed in partnership with Traditional Arts and Ethnology Centre, a private museum in Luang Prabang Laos. Check out our partnership exhibition online: Caregivers to Culture Keepers: Stories from Women from a Changing Laos and learn more about TAEC's work at: www.taeclaos.org. "Sharing women's stories is very important because people around the world don't know about the real lives of women in Cambodia. Sreyna is a long-time member of the PhotoForward team in Cambodia and has participated in workshops and projects since 2013. Recently, she co-organized all aspects of the Photo Challenge and Celebrating Women Exhibition. She also co-hosted the event and presented the awards. In addition to her collaboration with PhotoForward, Sreyna is also an NGO professional, working in the field of Social Work and youth development. There's nothing Sreyna can't do! Sreyna is an amazing woman and profoundly valuable member of our community. Join me in congratulating her for all of her accomplishments and thanking her for her generosity and talent! We hope that you will give what you can and also help us to reach out to new friends who may be inspired to support our work. Please select the giving level that works best for you, and click the corresponding link - thank you! $1,000 The Muse: Understands that creativity can change the world! PhotoForward has a big year ahead! Over the coming months, we're funding a photo trip for our community of young photographers to the distant and important Angkor ruin, Beng Mealea. This trip will offer an opportunity for intensive skills improvement, one-on-one feedback, and the unique experience to collaborate as a community of artists. In addition, PhotoForward is working to launch new partnerships with community organizations in East Indonesia and Borneo with a focus on expanding intergenerational projects for women and girls. Be sure to connect with us on Facebook, Twitter and Tumblr for updates on our creative adventures, news about our progress, and insights on the power and value of media literacy in the modern world. 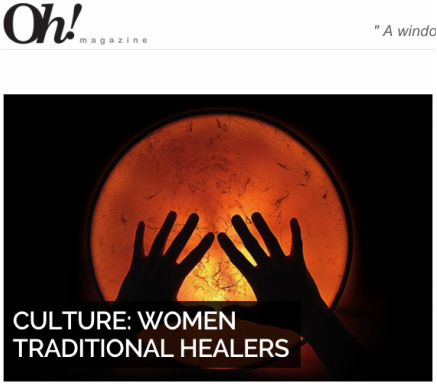 ​featured in the Women Traditional Healers article in Laos lifestyle magazine ​Oh! Check-Out PhotoForward on Raw Travel! Earlier this year Robert Rose and the crew of Raw Travel TV visited the Traditional Arts and Ethnology Center (TAEC) museum in Luang Prabang, Laos to check-out the PhotoForward/TAEC partnership exhibition Caregivers to Culture Keepers: Stories from Women in a Changing Laos. Our thanks to Rob and Raw Travel for sharing our story! View the Southeast Asia Road Trip trailer! 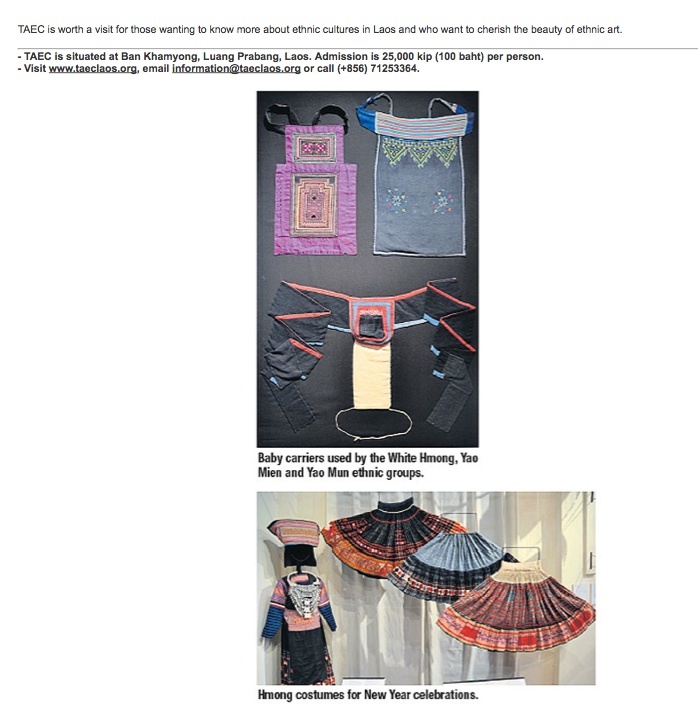 *Images featured in this newsletter were created in collaboration with Raw TV and our partner Traditional Arts and Ethnology Centre a private cultural museum in Luang Prabang, Laos. Thanks to your support, 2015 has been another exciting year for PhotoForward! We've established new partnerships, connected with new communities, expanded our team, shared our media makers' work in galleries and at community celebrations, and extended our local and global impact. We’re so proud that our artists and programs have been celebrated and recognized around the world, but our real success continues to be measured through the individual accomplishments and collective achievements of our participants and partnerships. "Photography shows feelings that I can’t describe and helps us document our own lives and experiences. Photographs help us to see the problems, so we can solve the problems." We’re excited to share the latest news about our programs and hope you will join us in celebrating a decade of community engagement, activism, and collaboration with a much-needed contribution. Check out our updates below, then help support our programs, so we can keep connecting communities through projects that inspire social change, creative collaboration, and cultural understanding. HURRAY FOR OUR TEAM! : Better Together at PhotoForward in 2015! THANK YOU! 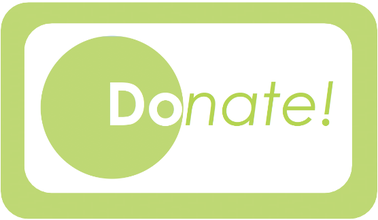 : Your Support Makes Our Work Possible! The amazing Scholarship Students from our new partner, Journeys Within Our Community (JWOC), created their first collection of photographs during the intensive 'Our View, Our Story' photography workshop. Through this workshop -- coordinated and co-lead by Konthea Mean, JWOC Program Manager and alumnus of the Through Our Lens program at Women's Resource Center -- students learned how to use digital cameras, compose photographs, edit on the computer, and create images that convey their experiences and interests. They also discussed the power photographs and visual media have to shape the way we see our world. Through their images, our artists are sharing a glimpse into their lives and communities from their own perspectives and developing professional skills that they can use in their careers and pass on to the next generation. In October, the Culture Keepers exhibition was featured in the Southeast Asia Road Trip episode of Raw Travel TV hosted by Robert Rose. Raw Travel is unique in that it is independently produced and financed and focuses on socially conscious travel. Tune in December 12 & 13 to see a repeat of the broadcast and visit RT website for times and channels! 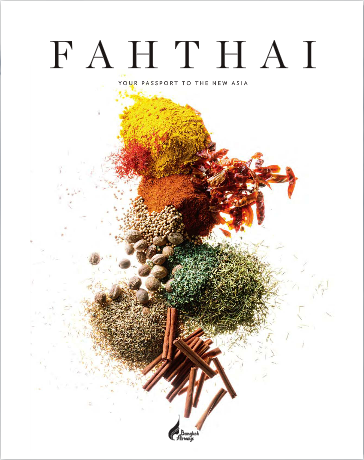 The 'Culture Keepers' exhibition and artwork were featured in Bangkok Airways in-flight magazine "Fah Thai" and the new Lao lifestyle magazine "Oh!". Visit our News page to see the issues and read the articles! A selection of community media films from the exhibition are currently featured at the Luang Prabang International Airport! These beautiful documentary films, made by and about Lao women and girls, are now educating visitors about the remarkable lives and cultures of Laos' ethnic communities. View the films in our Media Gallery! The Stitching Our Stories project was developed through the partnership of PhotoForward and the Traditional Arts and Ethnology Centre, a private museum in Luang Prabang Laos. Check out our partnership exhibition online: Caregivers to Culture Keepers: Stories from Women from a Changing Laos and learn more about TAEC's work at: www.taeclaos.org. In July 2015, we completed our advanced workshop series, Through Our Lens, with Women's Resource Center in Siem Reap, Cambodia. The Through Our Lens team is a diverse group of Cambodian women who have come together over the past year to gain skills in photography, documentary video, and community research. The participants were also introduced to innovative community research software in collaboration with the Map Your World project -- a trailblazing media program developed by The John W. Gardner Center for Youth and their Communities at Stanford University and Independent Television Services (ITVS). Through their photos, videos, interviews and research the Through Our Lens team has helped illuminate the lives, challenges, hopes, stories, and strengths of women in their community. Their images and interviews were featured at the International Women's Day Celebration in Cambodia and their films and research data will be released in January 2016. Stay tuned! Click here to learn more about Through Our Lens! 4. HURRAY FOR OUR TEAM! We're incredibly grateful for the amazing team that has come together in 2015 to contribute to our projects and support our community. In January, we welcomed An Sarout, as our first Program Assistant Intern for Cambodia. Sarout was an alumni of our 2012-13 Viewfinder project for Cambodian women and girls and has taken on a wide range of responsibilities in the office and classroom. Sarout has been a huge help this year and we're excited to see where her skills and enthusiasm take her next! Heang Heng is our new editing and film consultant. Heng is a budding Cambodian filmmaker and a proud member of the Green Gecko NGO community. Heng recently won the Cambodian Film Festival Student Award and is currently working on the production of the new film by Angelina Jolie. Heng is helping edit the films and interviews made by women in our Through Our Lens community media program. We're so happy to have Heng aboard! We are also indebted to our volunteers who have worked closely with Sarout to translate our films and support our partnerships. A HUGE thanks and shout out to Chris Cusick (Lost Lens Photography), Danielle Veal, and Darcie DeAngelo for your time, commitment, enthusiasm and investment in our work! PhotoForward is a small program that makes a big impact on a lean budget. We are especially grateful to our generous supporters who contributed throughout 2015 to bring our programs to life. When I say that our projects are impossible without your help, that is absolutely true. Over the coming months, PhotoForward is transitioning from our completed projects and establishing funding for new partnerships and programs for women and girls in South East Asia. We look forward to continuing our work with ongoing partnerships, building on our collaboration with the Map Your World team at Stanford University, and developing improved strategies to signal boost the stories and voices of the communities we serve. We hope you will continue to support PhotoForward in 2016, as we lay the groundwork for the next decade! This year marks the 10th Anniversary of PhotoForward (woohooo!!! ), and we’ve kicked off 2015 with inspiring projects, new team members, media milestones, community exhibitions, and celebrations of our local and global impact! We’re super excited to share the latest news about our programs and achievements and hope you will join us in celebrating a decade of community engagement, activism, and collaboration with a much-needed contribution. PhotoForward needs to raise $5,000 by June 3rd to keep our programs running, and we need your help to spread the word and reach our goal! In December 2014, we launched our advanced workshop series, Through Our Lens, with our amazing partner Women's Resource Center in Siem Reap, Cambodia. The Through Our Lens team is a diverse group of Cambodian women who have come together over the past year to gain skills in photography, documentary video, and community research. Through their work, they have helped illuminate the lives, challenges, hopes, stories, and strengths of women in their community. In addition to training in documentary video and oral history collection, the participants also learned to use computer tablets and innovative community research software in collaboration with the Map Your World project -- a trailblazing media program developed by The John W. Gardner Center for Youth and their Communities at Stanford University and Independent Television Services (ITVS). MYW combines new technology with community outreach and was inspired by the remarkable grassroots mapping project created by youth at the Prayasam organization in Kolkota, India. On March 8th, the Through Our Lens team exhibited their images, stories, and research results at the WRC International Women's Day Community Celebration. The full-day event at the Royal Gardens in Siem Reap was open to all and included music, performances, information stations, and dancing provided by NGOs from around Cambodia. The event culminated in the presentation of Certificates of Achievement for the Through Our Lens participants in honor of their contribution to the project over the past 18 months. In addition, each participant received a digital camera of their own provided by PhotoForward and our supporters. Click here to view the Through Our Lens (TOL) media research project! 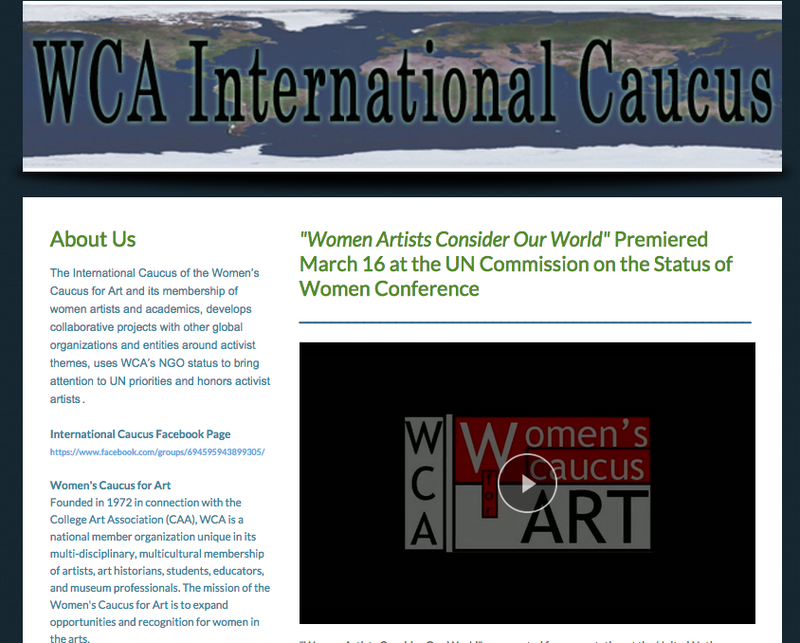 PhotoForward is extremely proud and delighted to be featured in the Women's Caucus for Art film, Women Artists Consider Our World, which premiered on March 16 at the 59th United Nations Commission on the Status of Women (CSW). Big congratulations to PhotoForward artists Ashley Fogah, Alexa Macauley, Maiying Xiong, Sompanee Xaymuangsing, Bao Xiong, Ye Her, La Tao, and Pasong Ly whose artwork was included in the film and especially Meri Marabyan, whose spoken word performance on the power of art was a highlight of the WCA panel at last year's United Nations CSW Conference! It's been 16 months since we launched the Stitching Our Stories YouTube Page, and we've already passed the 25k views milestone. Celebrate our success with a PhotoForward film fest and learn about the lives, traditions, and hopes of women in Northern Laos. "This is the first time I have done this kind of work, and I was so shy at first. Now I am more confident, and this opportunity has changed everything in my life for the better." Welcome to PhotoForward, Sarout! What better way to start the New Year than by celebrating the addition of our new Cambodia Project Assistant. Sarout was previously a Peer Leader for the Viewfinder: Art as Therapy Program and will be providing program and teaching assistance on all of our Cambodia-based programs, including Through our Lens with Women's Resource Center, Map Your World, and Journey's Within Our Community. We're so happy to have her on the team and are looking forward to an amazing year of creativity and social change! Click here to support PhotoForward! In order to complete our current projects in Cambodia and develop new programs in under-served communities in Asia and Eastern Europe, we need your help to raise $5,000 by June 3rd. We hope that you will give what you can and also help us to reach out to new friends who may be inspired to support our work. PhotoForward has a big year ahead! Over the coming months, we're launching an intensive workshop series for youth at Journey's Within Our Community; providing additional workshops and professional development training for the Through Our Lens team and staff at Women's Resource Center; collaborating with the Map Your World team at Stanford on new projects; and establishing new partnerships in Asia and Eastern Europe! Stay tuned for updates and information, and thanks again for your ongoing support! Directed/curated by Maureen Burns-Bowie and edited by Jodie Childers and Dan Messina,Women Artists Consider Our World showcases activist art from WCA members and some of the children with whom they work: Alli Berman, Ammallith, Maureen Burns-Bowie, Chittaphone, Sherri Cornett, Linda Rae Coughlin, Betsy Damon, Liz DiGiorgio, Angel Fogah, Joanna Fulginiti, Mary Hamill, Marjorie Hamlin, Carole Richard Kaufmann, Anne Kantor Kellett, Simone Kestelman, Sheri Klein, Ikie Kressel, Alexa Macauley, Maiying, Meri Marabayan, Allison Milewski, Eva Preston, Seda Saar, Bonnie Jo Smith, Helaine Soller, Sompanee, Bao Song, Yachur and Latao, Ying Song, Elizabeth Sowell-Zak, Joyce Ellen Weinstein, Negin Sharifzadeh with SPECIAL ARTIST: Maya Angelou. What a year it's been! Five film festivals in four countries. 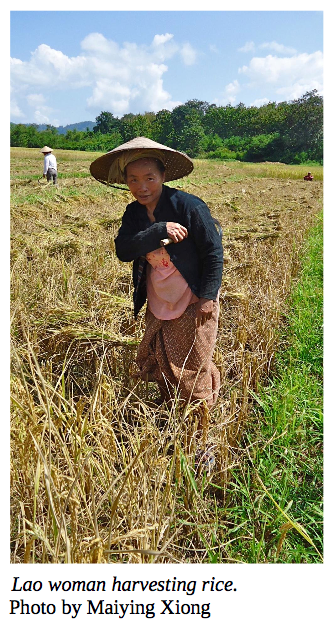 Three gallery exhibitions, including Between History and New Horizons: Photographs of Women, Work, and Community in Laos, at the Asia Society Texas Center in Houston. The opening of a trail-blazing, two-year museum exhibit, Caregivers to Culture Keepers: Stories from Women in a Changing Laos at the Traditional Arts and Ethnology Centre* in Laos. 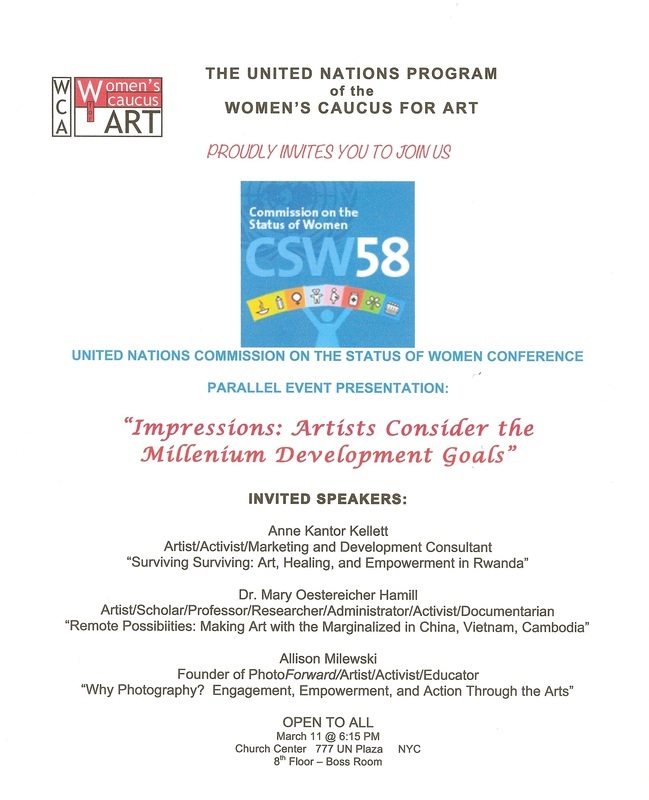 And a presentation on the power of art in the fight for social justice at the United Nations 58th Commission on the Status of Women at UN Headquarters in New York. We’re so proud that our programs have been celebrated and recognized around the world, but our true success continues to be measured through the individual accomplishments and collective achievements that occur everyday in PhotoForward’s ongoing workshops and community collaborations. That’s where the real challenges are faced and where the love of our work and commitment to raising women’s voices is realized. We've accomplished so much in the past few years, but we’ve only just begun to tap into the full potential of our programs. In the coming year, we're continuing our work in Cambodia with the remarkable Women’s Resource Center* and planning to expand our impact though projects in South East Asia, Europe, and the United States. We’re on a roll, but we need your help to keep our programs going. Please take a minute to read more about our recent projects and exhibitions, and then make a tax exempt contribution** in support of media education for women and girls in 2015! Thank you so much for your enthusiasm, encouragement and support, and warmest wishes for a very joyful and creative New Year! Click here to visit the PhotoForward Exhibition Page! PhotoForward works in partnership with local organizations, cultural institutions, women’s health and empowerment organizations, and public schools to develop programs that challenge, engage, educate, and inspire. Our programs are built to last, so we work closely with partners like Women's Resource Center in Cambodia to provide the training, resources, and support they need to ensure that they can offer media and arts-based programs to their communities long into the future. Click here to learn more about our programs and partners! 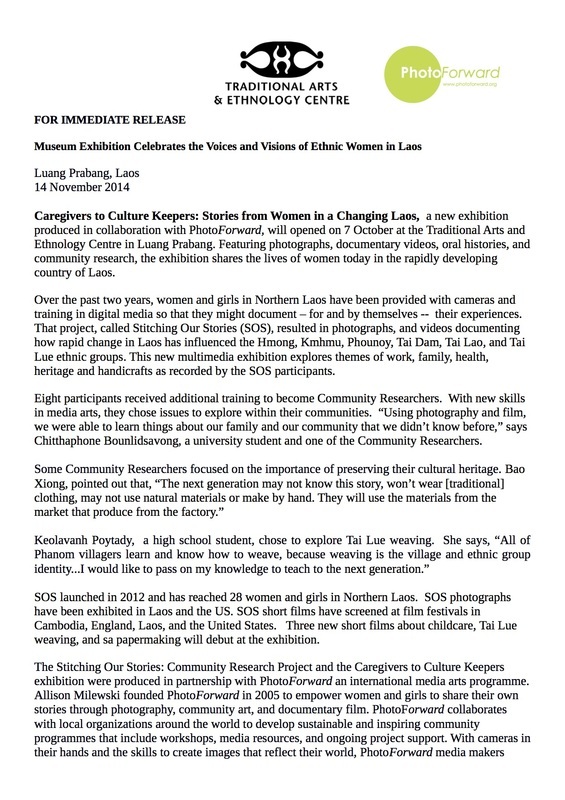 Caregivers to Culture Keepers: Stories from Women in a Changing Laos, the first community-curated museum exhibition in Laos, opened in October 2014. 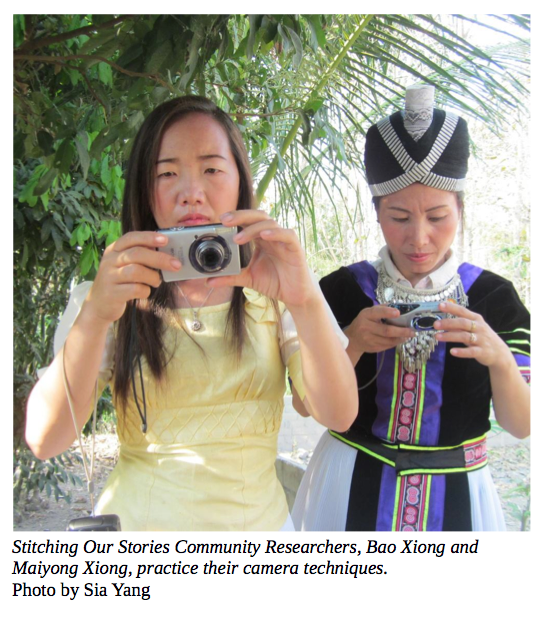 This two-year exhibit features photographs, documentary videos, oral histories, and community research by 28 Lao women and girls in the Stitching Our Stories (SOS) media program. SOS is a partnership project of Traditional Arts and Ethnology Centre* and PhotoForward. Click here to visit the Culture Keepers Exhibition Online! Check out media coverage and news updates about our collaborations, artists, projects and exhibitions. Visit our Website and News page to read about PhotoForward and our ongoing programs, and be sure to follow us on Facebook, Twitter, and Tumblr for all the latest updates and insights on our work, as it happens! MAKE IT A PHOTOFORWARD MOVIE NIGHT! Check out the Stitching Our Stories YouTube page for a variety of films capturing women's lives and stories in a changing Laos. Subjects range from traditional arts and cultural crafts to healing, shamanism, and the evolution of childbirth and motherhood traditions through the generations. 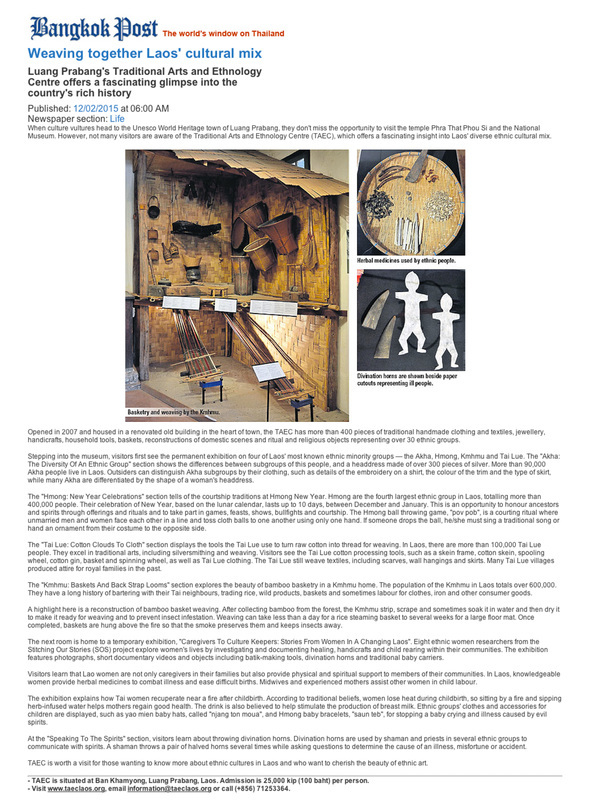 The page also includes a video introduction to the SOS partnership project developed by PhotoForward and Traditional Arts and Ethnology Centre*. Click here to learn more! An organisation dedicated to promoting cultural diversity and sustainable livelihoods in Laos. Founded in 2006, TAEC runs a museum showcasing ethnic cultures and traditions of Laos, a rural handicraft development programme with retail and wholesale outlets, and education and empowerment activities. The "Stitching Our Stories" documentary film is online! The "Stitching Our Stories" documentary and research films are online! This trail-blazing project engages women and girls from Laos' diverse ethnic communities to use photography, digital video, and community research to explore their cultural heritage, the vital roles that women play, and the often-seismic impact that modernization is having on traditional beliefs and practices. The film assembles four documentary shorts shot by the projects' Lao filmmakers--Bao Xiong, Pasong Ly, Sia Yang, and Mai Ying--that examine the intricate artistry of Hmong batik and embroidery and the complex and challenging lives of the medicine women and shamans who care for the bodies and spirits of their communities. The November 2013 Stitching Our Stories Community Celebration and pop-up exhibition was a big success! The exhibition, coordinated in partnership with Traditional Arts and Ethnology Centre, featured the work of 13 Lao women and girls from a range of ethnic backgrounds who came together to document the lives, stories, and faces of women and girls in their communities. Over the course of five weeks, the participants developed their photography skills and captured the varied roles of women and girls in a rapidly changing Laos. Check out the photos from the event and stay tuned for the new artist portfolios in the PhotoForward Web Gallery! This year's Community Celebration, coordinated in partnership with Traditional Arts and Ethnolo﻿gy Centre﻿, featured the work of Lao women and girls from a range of ethnic backgrounds, ages, and villages who came together to document the lives, stories, and faces of women and girls in their communities. Over the course of five weeks, the participants were introduced to camera skills and composition techniques that they used to record women and girls at work and at play and capture the varied roles of their mothers, sisters, family, friends, and neighbors in a rapidly changing Laos. The student research films from the 2012-13 Stitching Our Stories project will be screened at a special event on Wednesday, December 11 at the Luang Prabang Film Festival Visitor Center (Project Space Gallery) from 10am to 12 pm. The event will include a special presentation by the SoS filmmakers, interview subjects, and program organizers: Traditional Arts and Ethnology Centre and PhotoForward. The film assembles four documentary shorts shot by the projects' filmmakers: Bao Song, Pasong Ly, Sia Yang, and Maiying. These films examine the intricate artistry of Hmong batik and embroidery and the complex and often challenging roles of the medicine women and shamans who care for the bodies and spirits of their communities. 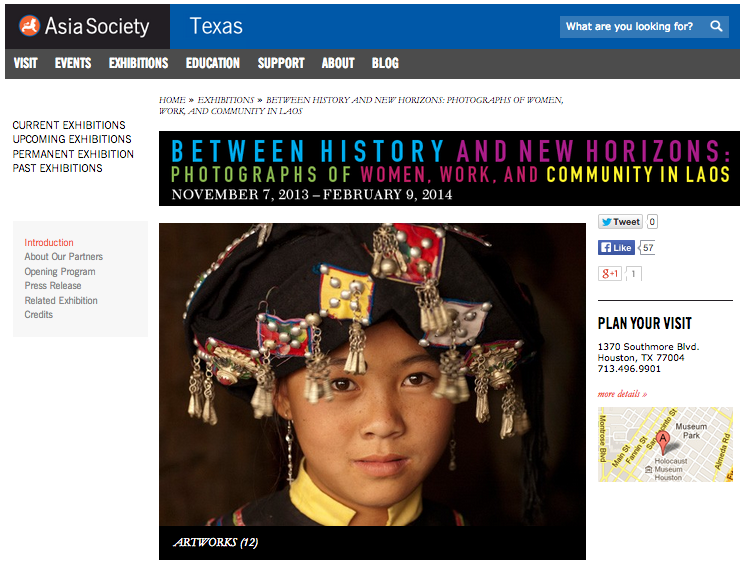 PHOTOFORWARD ARTISTS AND THEIR WORK FEATURED AT THE ASIA SOCIETY IN HOUSTON TEXAS! 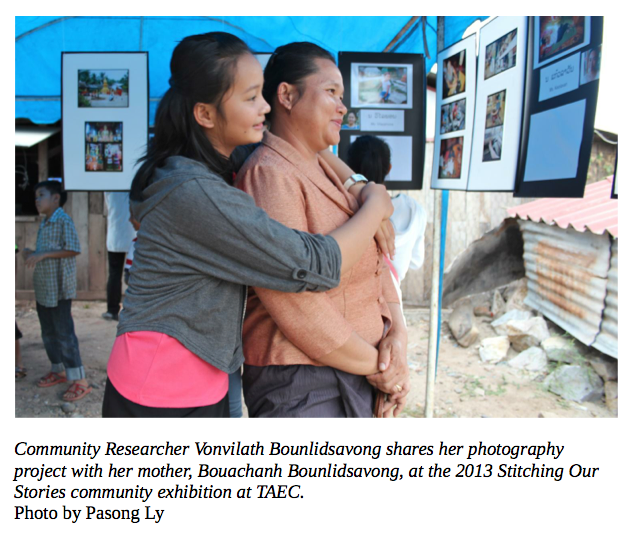 Forty photographs created by Lao women and girls in PhotoForward's Stitching Our Stories: Community Research Project will be featured at the Asia Society Texas Center in Houston, beginning on November 7th! This project was developed in partnership with the Traditional Arts and Ethnology Centre (TAEC) in Luang Prabang, Laos. The exhibit, Between History and New Horizons, depicts moments in the lives of women from the Lao People’s Democratic Republic and consists of professional portraits from TAEC's collection and personal photographs from PhotoForward's partnership project. Through their photographs, our artists invite us into their homes and communities and offer an intimate glimpse of the vital and varied roles that women play in Lao society as well as the often seismic impact that modernization is having on traditional beliefs and practices. Visit Asia Society Texas' website for more information, and be sure to visit the exhibition if you are in the Houston area! Help us continue to ignite creative communities of women and girls around the world by funding PhotoForward's RocketHub Campaign! The PhotoForward Advisory Team is an impressive collection of photographers, filmmakers, youth education specialists, social workers, and media makers working as a community to guide PhotoForward's growth and development. The goals of our Team are to help PhotoForward build on the success of past programs, point us in new directions, and challenge all involved to maintain the integrity of our approach: creating an environment where everyone’s voice can be heard and making sure that the product of our programs never becomes more important than the process or the people we serve. Join me in welcoming all of them, and learn more about the team on our Advisory Team page!